Like most financial institutions, Deutsche Bank remains sanguine on the future: it expects the S&P to keep merrily rising toward 3,000, and its house view is that the Fed will stick to its indicated tightening path, raising rates twice more in 2018 and another 4 times in 2019 (although Trump may have a nervous breakdown long before that happens and "resigns" Jerome Powell), while 10-year yields will eventually resume rising toward 3.5% as the curve ultimately resteepens removing concerns about an imminent recession. To be sure, the latest earnings season provides fuel for optimism as a whopping 90% of the companies that have reported so far have beaten on earnings, with earnings that are 4.5% above the estimates. Still, as Deutsche Bank admits, it is getting increasingly nervous about the prospects for both the economy and the market, and as a result its forecast is not sanguine about the risks to the forecasts, particularly given the uncertainty around trade tensions, coupled with building inflation risks given the strength in the labor market. As a result, the bank has proposed some "distinct alternative scenarios that we think markets should consider either as hedges to the current market consensus or to the House view." We think these potential “shocks” are very much still lurking in the wings. There are plenty of arguments for why they may not materialize, but to appreciate them early will allow investors an opportunity for efficient hedging strategies. To address these "potential shocks", DB's credit strategist Dominic Konstam is launching a series of 5 pieces, and overnight published the first part in which the bank focuses on market shock #1: a sharp weakening of the Renminbi as part of the reaction to the ongoing trade tensions. In other words, currency war (something which Goldman already tacitly admitted has begun). it is a reasonable response for China to maintain market share but at the expense of reserve accumulation. Of course, a weaker yuan should be seen in the context of general EM weakness and a tightening of US financial conditions via the stronger US dollar, unless somehow Trump manages to talk down the greenback. So why is the biggest German lender so nervous? Because, as Konstam writes, "this is as much to do with the uncertainty of the outcome as it does with the nature of the dispute." Or, as he clarified, "that uncertainty is a necessity of the unknown reaction function of both parties." And while one can simply chalk that down to "Trump is unpredictable", Konstam warns that it is a mistake to assume that the Administration simply wants concessions in various areas of trade with different trading partners, and instead believes that "there is a strong desire to rebalance economic power globally, in particular away from China and towards the United States." China is seen more as an economic competitor to the US than simply an “unfair” trading partner. Indeed, unlike America's other trading partners, "China is unique", and the following excerpt offers perhaps the best explanation of Trump's - and Peter Navarro's - thinking in relation to China (which many expect will surpass the US as both an economic powerhouse and military power in the next 2-3 decades). There is no other country that has transformed its global economic power on such a scale. It can therefore be treated separately. While less free trade with any country is undoubtedly a loss for global welfare, it is a matter for normative economics to judge the extent to which “free” trade is sufficiently “fair” trade. And that is why trade tensions with China are about the economic competition and not trade practices per se. Which is why these tensions will likely define markets going forward and are not easily resolvable. If one assumes the validity of this premise, then there can not possibly be a "happy ending" in which either the US or China concede, as the end game for trade tensions, particularly for those related to China, is likely to be increasingly worse tensions with the aim of rebalancing global growth, DB predicts. This ultimately might show up in some combination of less relative growth in China versus the US especially as well as the rest of the world and less reserve accumulation (via a deterioration in the term of trade ). 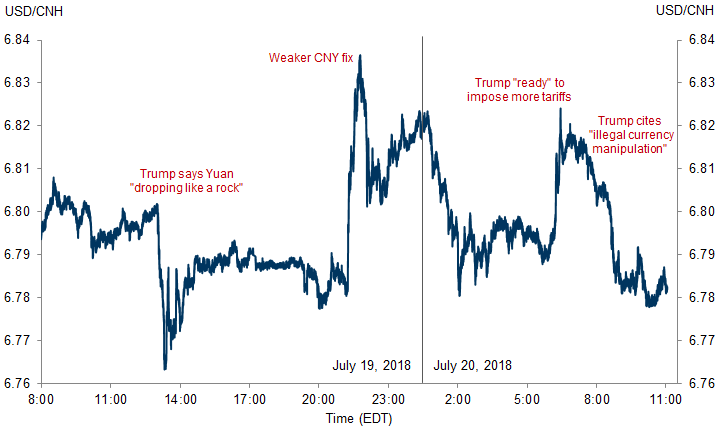 Meanwhile, now that it is conventional wisdom that trade wars have morphed into currency wars, Konstam also warns that the worse the trade tensions, the more likely the RMB is to weaken, which also explains Friday's sharp devaluation of the CNY by the PBOC which dropped the yuan by over 600 pips, sending the offshore Yuan "dropping like a rock" in the words of the US president, as markets realized that Beijing is ready and willing to engage the US in both trade and currency war. If China were to maintain the value of the Renminbi, any tariff will effectively curb its exports and force real growth loss as a first order effect or a cut in RMB export pricing (the terms of trade deteriorate). For the same level of RMB, there is consequently less reserve accumulation as the trade surplus deteriorates; a cut in RMB pricing, however, also reduces reserves. US growth would be weaker and inflation higher. Alternatively, China can - and already has started to - devalue to absorb the whole tariff impact. This implies a more complete deterioration in the terms of trade but export volumes would be supported. And this is where the shock part comes in: China’s reserves would deteriorate as unchanged RMB earnings buy fewer dollars; in fact if the yuan devaluation is sharp and fast enough, it would launch another all-out capital flight out of China, something we already saw in June, when in June China suffered a net FX outflow of $16.6BN ($9.9BN from onshore FX settlement, and another $6.7BN from cross-border RMB flows), reversing the inflows of the past two months. 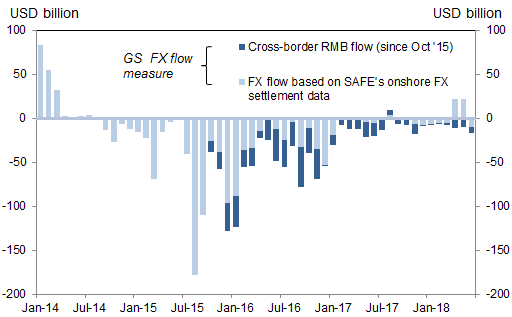 Escalated sufficient, and a full-blown reserve liquidation in which the PBOC is eventually forced to defend the Yuan as residents bypass all FX firewalls to park their liquidated assets offshore - a repeat of late 2015 and 2016 - would be inevitable. As a result of the devaluation, which would lead to a deflationary wave across the world as was observed in 2015/2016, there will be a loss in global growth due to the distortionary impact of tariffs. The lack of growth will encourage competitive devaluations among competitor countries and would be the catalyst for EM weakness to the extent that the global growth was smaller. Think 2009, when every central banks scrambled to slash rates and launch QE in an attempt to beggar its numerous money printing neighbors. The bigger risk for financial markets is an accelerated Chinese devaluation "that emphasizes at least a short run desire to maintain export volumes and the RMB surplus albeit at the expense of reserve accumulation." Meanwhile, as noted above, a key issue is whether a weakening RMB drives capital out and the extent to which the PBOC might defend the currency. The nature of the shock is therefore if the PBOC wants to protect reserves it would tolerate more currency volatility and potentially a deeper correction. The lesson from 2015 was that in managing the currency there were extensive reserve losses. This time might be different in the context of trade tensions. Of course, since a Chinese devaluation would not occur in a vacuum, especially with Trump officially raging against a stronger dollar and a Fed that is "unnecessarily" hiking rates, DB also analyzes the RMB devaluation in terms of financial conditions and the impact on the Fed stance. As was the case in 2015 and has held true of late, a quickly depreciating CNY would inevitably be accompanied by similar scale weakness in other EM Asia FX – as was the case in 2015 and has been the case for the bulk of this year. In the first instance, this would translate into a lower risk neutral rate and on balance a steeper curve with a bullish bias. The extent to which risk assets can weather the storm is a function of term premium. Lower risk neutral is clearly negative for risk assets but if inflation term premium rises and real term premium is stable or lower, risk assets will be insulated to some extent. Finally, from this one can also extrapolate the Fed's reaction function, or rather the implied change in the Fed stance – defined as the 12-month change in spread between the real funds rate and r-star – which moves along with financial conditions, with Fed stance getting tighter as conditions get easier, and vice versa. As a result, Konstam estimates the equivalent Fed easing that would typically be associated with the various shocks to financial conditions under the different CNY scenarios. What he finds is that if the PBOC were to launch a currency war nuke, and send the USDCNY higher by 1,200 pips to 8.00 or so, the Fed would need to cut by 55bps, or just over 2 rate cuts, in the span of 3 months. And here a big problem for the Fed emerges. While Jerome Powell would be perfectly justified to cut rates in response to China's nuclear currency weapons - as Deutsche Bank's analysts suggests - it would also be seen as doing the bidding of Donald Trump, who has made it clear he want the Fed to hike at most 2 more times then stop the tightening cycle, and ideally, to start cutting rates (if not launch QE tomorrow). As such, the moment the Fed does cut rates in reaction to China's devaluation, the US central bank would immediately be accused of folding to the president and abdicating its independence, an event which while hardly new (read about the "independence" then-Fed chair McChesney Martin had under LBJ here), would result in a shock the system, and lead to a plunge in the value of the dollar and a surge in bond yields and, adding insult to injury, would result in even more Chinese devaluation, at which point the final race to the currency bottom will have begun. Meanwhile, if the Fed refuses to cut rates in response to the dramatic collapse in financial conditions that a sharp yuan devaluation would entail, if only to demonstrate just how independent it is, then China wins as the US stock market will finally tank, forcing Trump to wave a white flag of surrender, conceding the trade - and currency - wars to China. (We will not discuss how Trump successfully managed to trap himself, launching a dollar spike thanks to his late cycle fiscal stimulus coupled with his trade and FX war with China while also jawboning the Fed into a corner where rate cuts are virtually impossible unless the market and economy both tank, as it should be rather obvious by now).